If the following photo is taken in some third world country, the entire world cry 'murder' and condemn the country as savages and beasts. Besides, if some third world country mixes horse meat into buffalo meat, its entire aid would be stopped for crime against humanity animals and life. But when the same thing happens in Europe, only the companies involved are cursed - double standards for developed and developing countries. 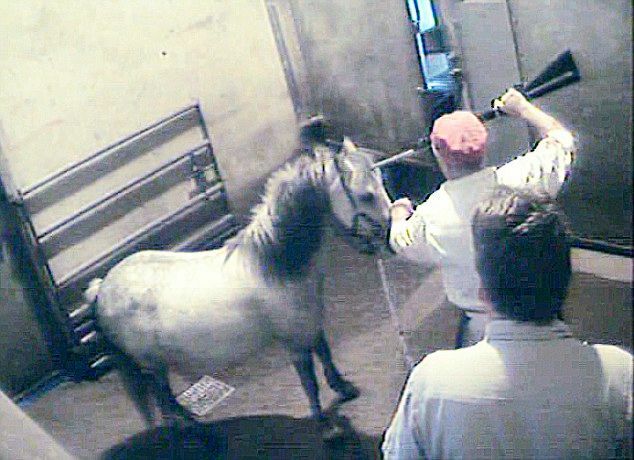 In the above photo, a slaughter man positions a rifle on a pony's head seconds before it is fired to end pony's life. Thereafter the 'murdered, pony is winched on to the production line where her throat is cut with a razor sharp knife, severing the carotid artery.